A male wild elephant was suspected to be electrocuted at Majgaon village of Kalakhowa area located around 24-km from Dibrugarh town on Tuesday morning. A two-month baby elephant was rescued near the carcass of the elephant by forest official and took it to Khowang range office. “Villagers informed us about the incident. We rushed to the place and found that a 12-year old male elephant lying dead on the paddy field. 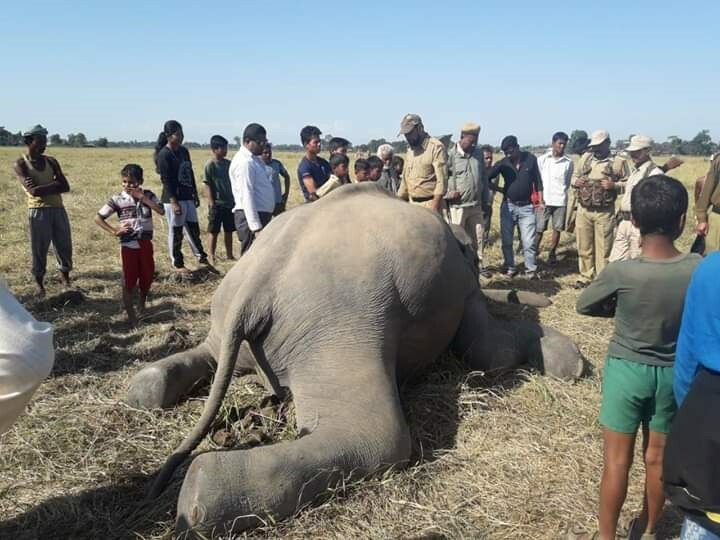 The elephant may have died due to electrocution as farmers tend to put live electric wires around their paddy fields to prevent the elephant herds from destroying their crops. We are waiting for the autopsy report,” said Biraj Barman , Ranger of Khowang forest range. The elephant is said to be part of a herd that has ventured out from Dehing-Medela reserve forest in search of food. He said that they had rescued a two-month baby elephant from that place and after giving some treatment brought it to Khowang forest range. “We have sent the baby elephant to Centre for Wildlife Rehabilitation Conservation (CWRC) at Kaziranga for treatment. The baby elephant was suffering from dehydration and too weak,” the Ranger informed. “We are not ruling out death of the jumbo due to electrocution. We are waiting for the autopsy report that is expected on Friday. We will decide on our next course of action including lodging of FIR in the police station on the basis of the autopsy report. Now we have the major task to dispose of the carcass properly before it starts decomposing,” Barman said. According to the locals, the elephant come out from the nearby forest in the night in search of food and rampaged their crops. “During winter we have sleepless nights because of possible raid by wild elephants in our village. We have reported the matter to the forest department but they are not taking the matter seriously,” alleged a villager.